Partly cloudy. Low 51F. Winds NW at 10 to 20 mph. Traditional lamb barbacoa is a popular dish at Aqui es Texcoco, a chain that opened its first Bakersfield location in the northeast earlier this year. 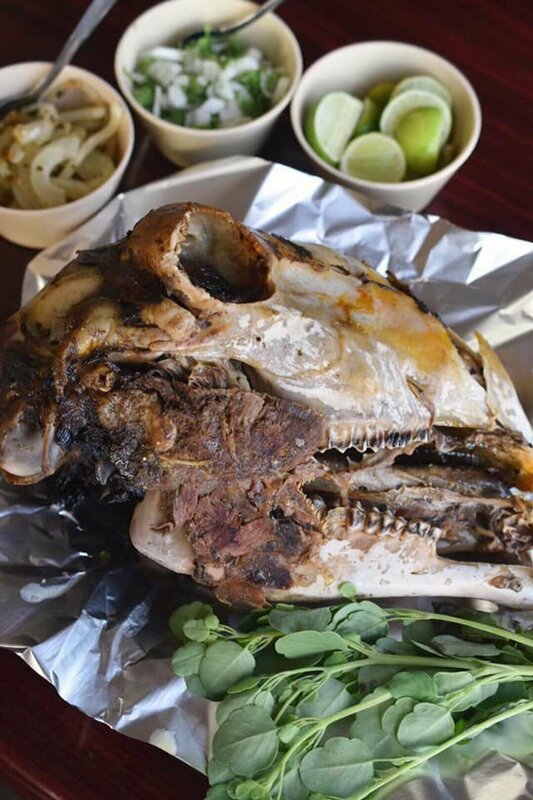 Not your average Mexican restaurant, Aqui es Texcoco specializes in lamb barbacoa (barbecue), offering it in a number of different ways including the head. Aqui es Texcoco is located on Mount Vernon Avenue in the spot last home to Lumberjack's. Enfrijoladas — tortillas stuffed with melted cheese, dipped in thinned beans and served with cream and fresh cheese — are served at Aqui es Texcoco, a New Mexican restaurant in northeast Bakersfield. Grilled quail, marinated in dark beer and spices, is a specialty at Aqui es Texcoco, which opened its fourth location in northeast Bakersfield. Quesataco, anyone? Aqui es Texcoco in northeast Bakersfield serves a "grilled cheese" taco packed with queso and your choice of fillings including barbecued lamb, chicken, mushrooms, blood sausage, huitlacoche (corn fungus) and more. Adventurous diners can dig into a plate of chapulines, aka grasshoppers, with a side of avocado slices at Aqui es Texcoco in northeast Bakersfield. The restaurant is in the former home of Lumberjacks. Grilled cheese like you've probably never had it at Aqui es Texcoco. The new Mexican restaurant serves if chicharron de queso with a side of guacamole. Even after we’ve lost Mexicali West, La Colonia and Sinaloa in recent months, you could understand that sentiment given how many fine Mexican restaurants we already have. But Aqui Es Texcoco is nothing like anyplace else that’s here now. And it’s not just the quail and the grasshoppers on the menu that earn it that distinction. This is a fascinating place. People think of Mexican restaurants they think of the usual suspects — tacos, enchiladas, chips, fajitas. This place specializes in barbecued lamb, and it’s a must-order on the menu and the good news is you can get it in so many different ways, including the head. Forewarned, we ordered accordingly, though we arrived late on a Saturday night and word was not yet out about this place so there was plenty of lamb. My companion chose the three enchiladas plate ($8.75), choosing the lamb, chicken and refried beans and cheese for her fillings. I went for the quesataco ($4.15) filled with lamb and the flautas ($8.75) filled with lamb, chicken and beans. We saved room for the house-made flan ($4). If you prefer you can just order a plate of the lamb with all the fixings as Gold described above (one-third pound $12, half pound $13.95 — go big and bring any you can’t finish home for leftovers), and it is definitely the house specialty: juicy, smoky like great pit-style beef in texture but with the more interesting notes you get from lamb. My companion when told about the place got a quizzical look but could not believe how amazing it was. Particularly in that grilled cheese taco. Now I know a lot of restaurants trying to please keto customers are offering those tortilla-free tacos with “shells” made from firm melted cheese, but the version they offered will win over even those lukewarm on the appeal of the amazing dairy product. It sort of melted on the plate after being stuffed with the hot lamb, best consumed with a fork but such a compatible marriage we can’t imagine ordering any of the other meats. Reader Tim Ross had emailed us saying he wasn’t particularly a fan of lamb as prepared Basque style but he loved it. My companion’s enchiladas were presented not rolled but with tortillas dipped in the sauce and plated as if they were tacos. The chicken was respectable, though trying it after the lamb really wasn’t fair. The flautas were crispy and coated with lettuce, cotija and cream. The end result of our dinner, however, was a lust for more of the lamb, and on our next visit we’ll just get the eight ounces with tortillas and beans and dig in. This is not the sort of restaurant where chips and salsa are brought out as the first course. Instead you get lime wedges, chopped white onions with cilantro and these amazing spicy white onions that are a perfect garnish for any of what the kitchen brings you. Particularly perfect for the chicken. You will see so many items on the Aqui menu that are not typical for our city. The lamb is available as meat, rib, tripe, brain (available only in tacos) and the head, “seasoned and cooked in the oven” according to the menu. You can get the lamb meat Mediterranean style with pita bread and a dill yogurt sauce. Lamb cooked in parchment, grilled cactus, blood sausage, pressed pork belly, grilled quail marinated in dark beer, grasshoppers with avocado slices. I am constantly reading futurists who tell us that eventually insects will be a natural part of the American diet, as if someday we’re all going to evolve into Anthony Bourdain-like clones eating anything put on a plate in front of us, as if it’s all a dare. I’m also aware that this style of eating is common in many parts of the world. I’m not there yet. You can even get a side dish of guacamole with grasshoppers. Don’t say you weren’t warned. The back page of the menu tells you the story of the Texcoco region that reminded me of that great book by Diana Kennedy, “The Essential Cuisines of Mexico.” The menu page outlines the traditions of slow roasting meat in underground fire pits covered with maguey leaves, a process they’ve tried to replicate in a special oven that led to the restaurant getting press from Rachel Ray and The Travel Channel. Service was stunningly professional for a new restaurant, from a young, eager, well-trained crew that seemed to expend a lot of calories taking care of everyone without stressing. Aqui es Texcoco can be recommended for a fine dining experience. But trust me on the lamb. 2673 Mount Vernon Ave. 742-1877. Hours: 8 a.m.-9 p.m. every day. Karaoke 5-9 p.m. Fridays. Reservations recommended. Prices: Side dishes $1.50-$9.95, soup $2.85-$6.75, house specialties $4.65-$14.25, combination plates $10.95, lamb barbecue entrees $2.85-$43, “Other plates” $2.85-$8.75, desserts $4. Child’s plate $6.75. Details: Full bar service; many vegetarian options; family friendly, delivery with Grubhub and UberEats.